For works of the characteristics and dimensions of this project, a few lines are hardly enough to capture the nature and the thousands of details that surround it, so we will focus on the ventilated façade made withKRION, and on a later occasion we will talk about its interior. 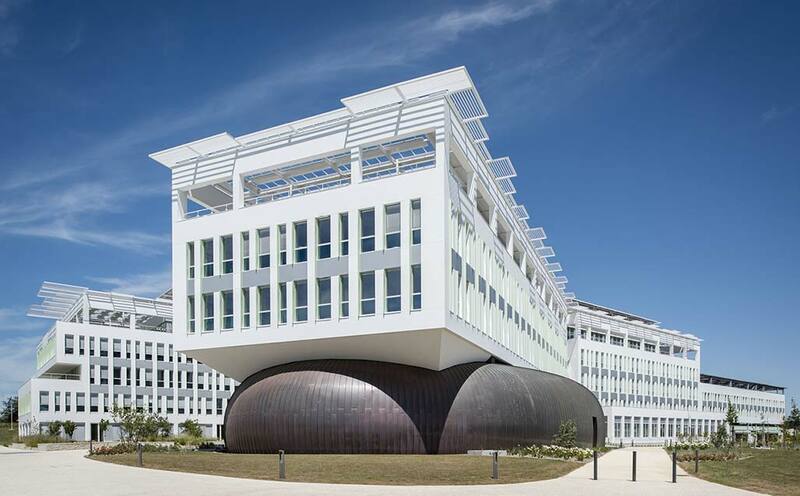 The engineering department ofButech, a company belonging toPORCELANOSA Group , has provided technical solutions to the façade ofOry & Associates Architecture Studios, a company founded in 1979 by the architect Jean-Jacques ORY, currently has about 60 employees. The main architects of the Credit Agricole project were Jean Pierre Duvert and Bojana Popovic, who have created a modernist building with classical references, base, body and frieze, as a story. The geometry of horizontal lines is defined by the length of the building and the large openings located in the body of the construction. The 6000 m2 of KRION installed in the ventilated façade of Crédit Agricole Poitou-Charentes (Lagord, France), were 1100 Snow White . Due to its mostly mineral composition and a small percentage of acrylic resins, it is ideal for any project, and in the case of this ventilated façade, the French brand CSTB has been adjusted to French regulation, so that in the unlikely event of ruptures due to knocks, no material will come loose.